Unless you’re born with stick-straight locks—which I wasn’t—it can be a cruel, cruel summer in terms of frizz. I barely step foot out the front door before my elbow-aching blow-out kinks up into fuzzy waves. My quest for products to help with frizz always led me to formulations that either weighed my hair down or made it look greasy. Sometimes, the products just didn't work at all. That is, until I discovered two light-as-air sprays that actually block humidity from penetrating the hair cuticle so that frizz never has the opportunity to lay claim to my poor tresses. 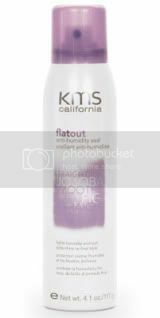 Mist on this seal after applying everything else—shine spray, smoothing cream, hairspray, —and it will seal in moisture and repel any outside kink-inducers from invading strands. And it will do all of this without adding any weight or texture to the hair. Even if you want to rock waves or curls, it prevents any unwanted fuzz from rising. The name says it all. This humidity blocker forms a seal around hair, literally blocking outside moisture from entering the shaft and lifting the cuticle. And this aerosol spray is actually super-lightweight, yet still manages to deliver a load of bonuses: antioxidants to repair current damage, UVA/UVB filters to prevent future damage, and tons of sheen-enhancing essential lipids.